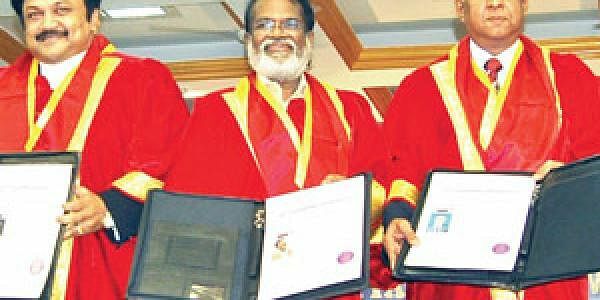 NEW DOCTORS: Actor Prabhu, Gangai Amaran and scientist S Sundaresh show off their honorary doctorates as Sathyabhama Chancellor Jeppiar looks on. CHENNAI: At its 20th convocation on Thursday, Sathyabama University awarded honorary doctorates to S Sundaresh, Distinguished Scientist & Chief Controller, R & D, (ACE), DRDO in recognition of his contributions to the field of technology management in the domain of Combat Vehicles, actor G Prabhu, singer S Chitra and music directory Gangai Amaran. Founder of the trust and Chancellor of Sathyabama University, Dr Jeppiaar, in his presidential address, stressed that the fruits of research should reach the common man. He added that research was an important component of academics and urged students students to take up research projects that could be implemented in real time. “The students here are walking away with three certificates — that of good conduct, a degree and the appointment order,” he said. In his convocation address, Sundaresh highlighted India’s achievements in engineering and technology. He stressed the need for entrepreneurship for the development of the nation. “There is a need for engineers to work along with scientists in developing the nation,” he said. A total of 1,816 undergraduate students of various engineering branches, 1,669 ME/MTech students, and 36 PhD scholars received their degrees.